I got back from my little vacation up north almost a week ago now and somehow I still haven’t cooked a meal for myself yet. Usually I’m dying to get back to cooking my own meals when I return from a trip, but this time I’ve been too busy to go grocery shopping or plan a meal and have therefore been eating a lot of peanut butter and jam sandwiches (thankfully I froze some fresh blueberry chia jam before I left) over the last week! But seeing as I used up the last of my frozen bread today, I think tonight I’ll finally force myself to go shopping and make some food to get me through the rest of the week! One of my go-to meals when I need an inexpensive and healthy meal that will give me leftovers for lunches through the week is this chickpea pasta. A sauce that’s made out of chickpeas may sound a little weird, but it tastes so good! I want to say it tastes like a white wine cream sauce but I’m sure someone who regularly eats cream sauces will disagree, so I’ll just say that it’s hard to guess it’s a chickpea sauce (unless you’re looking closely at the texture, which is of course a little chunkier than a cream sauce). I’ve adapted this Cooking Light recipe over several meals to my own liking, so that in my version I eliminate the raw garlic as I don’t think it’s needed, add cooked onion to the sauce for more flavour, use vegetable broth instead of chicken (not just to make it vegetarian but because I think it tastes better in this dish), and I add broccoli and increase the amount of veggies. I also like to use whole wheat pasta and have tried shells, rotini, and linguine – they all work. Feel free to use whatever vegetables you want too – mushrooms, zucchini, peppers, leafy greens – they’d all be great if you want to boost the nutrients even more. With the protein in the chickpea sauce, this makes a great vegetarian meal that will fill you up to power you through the rest of the work day, which, along with coffee, I will definitely be needing this week! Heat oil in a large saucepan over medium heat. Add onion and sauté until softened, about 4 minutes, stirring often. Add garlic and stir for another minute. Add salt, red pepper flakes, chickpeas, and vegetable stock. Bring to a boil, cover, reduce heat, and simmer 15 minutes. Meanwhile, cook pasta in salted boiling water according to package directions. During the last few minutes of cooking, place broccoli in a steamer and set covered over the boiling water until bright green. 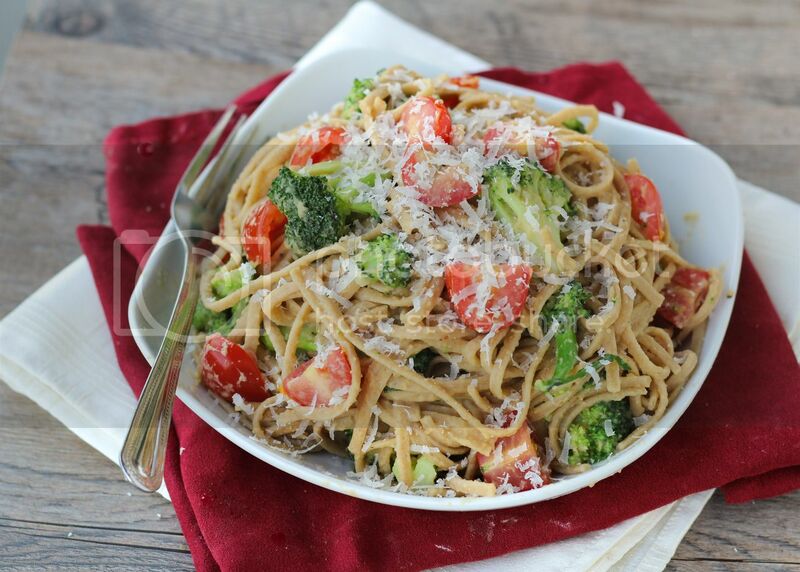 Drain broccoli and pasta, reserving 1/4 cup of the pasta water. Place chickpea mixture in a food processor. Add lemon juice and reserved pasta water and blend until smooth. Season with additional salt and pepper if desired. 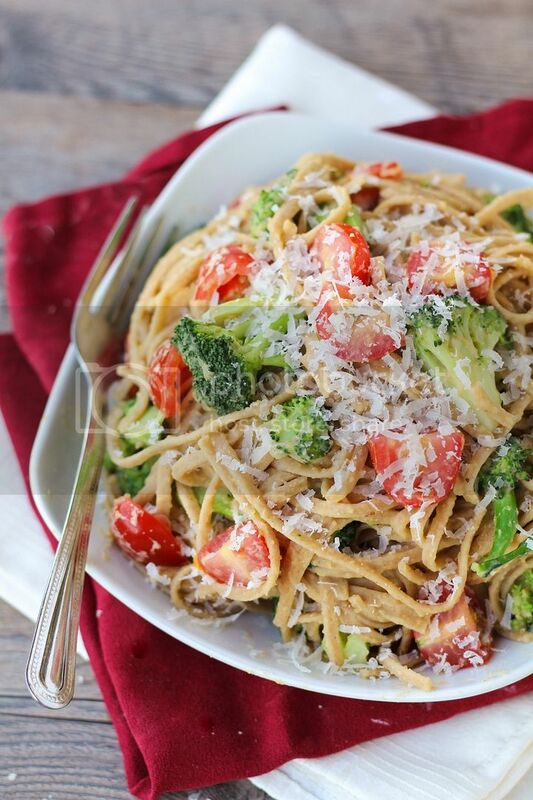 Combine chickpea sauce, pasta, broccoli, and tomatoes in a saucepan or large bowl and toss to combine. 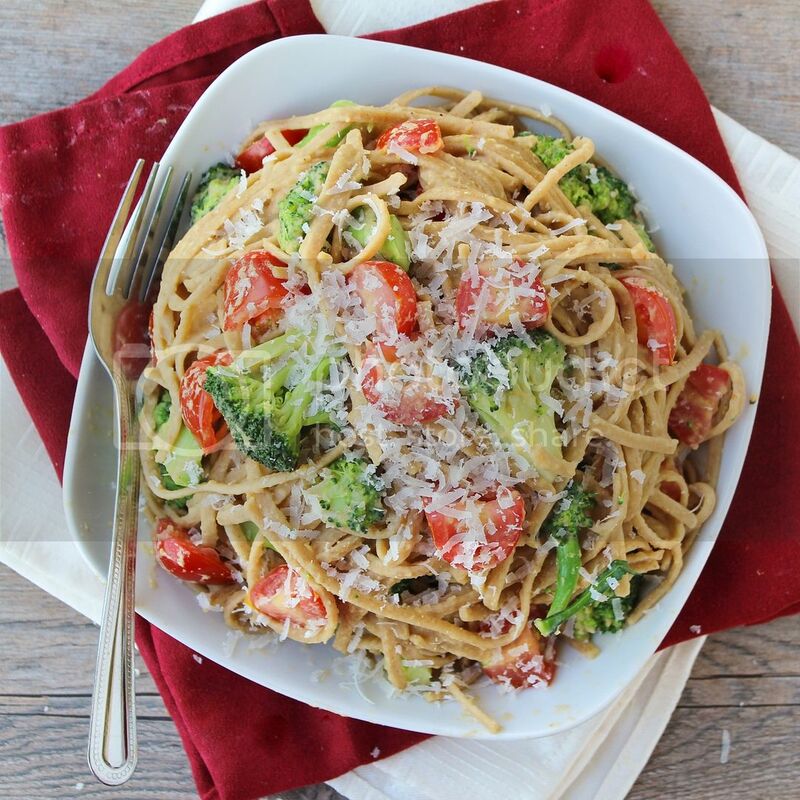 Serve warm, topped with grated parmesan cheese. Season again with salt and pepper if needed.